Apple Reveals Black Friday Deals For Australia, Canada Similar? Apple has revealed their Black Friday deals (check out other deals here) on the Australia online Apple Store, however shoppers can expect the same or similar discounts here in Canada. Select Mac products are being discounted between 8-10% on entry level configurations and between 4-5% on the more advanced configurations. iPod Touch is receiving between 8-10% discounts and the iPod Nano is receiving between 4-6% discounts. The remaining accessories and products are receiving between 4-15% discounts. There are also many more third-party software products and accessories on sale as well. 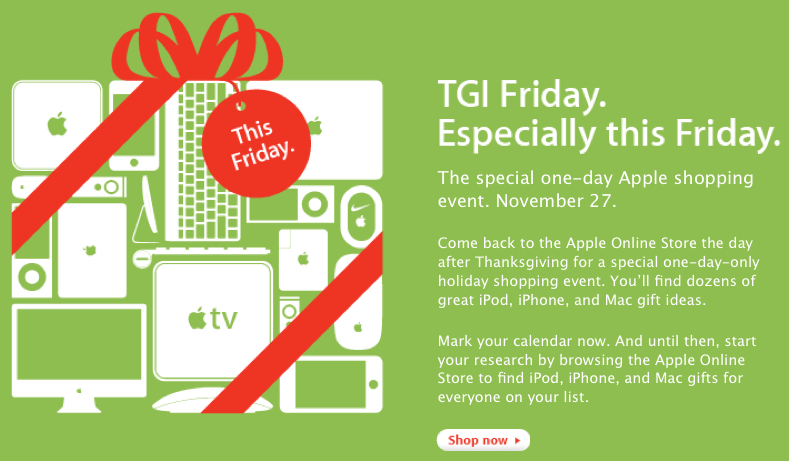 Also note that the Black Friday deals on the Apple Online Store are reflective in the Apple Retail Stores.